Second Chance to Apply to Poly School for Advanced Studies! Late Application Window NOW OPEN!! 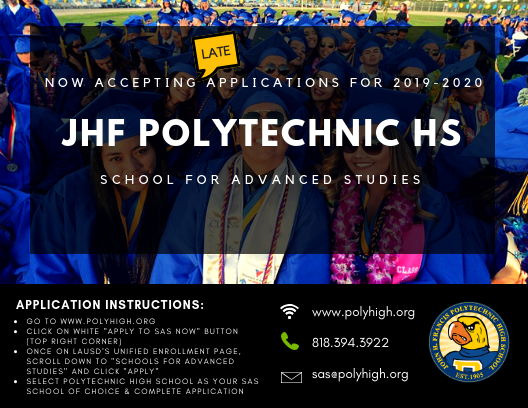 If you missed the November deadline to apply to Polytechnic High School's School for Advanced Studies program, the LATE APPLICATION WINDOW is NOW OPEN! Click on the button on the top, right corner of our school's site to be directed to LAUSD's Open Enrollment page, and APPLY NOW!